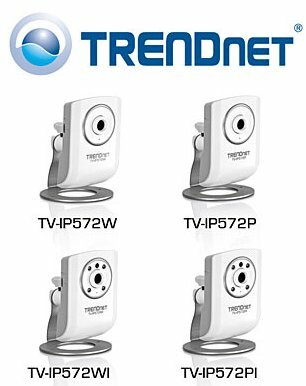 TRENDnet, a best-in-class wired and wireless networking hardware brand, today announces the availability of four new megapixel IP cameras which offer H.264 megapixel image quality, a free mobile app to view video while on the go, and new industry leading free camera management software. "TRENDnet is bringing value to the megapixel IP camera segment," stated Sonny Su, technology director for TRENDnet. "This is the first grouping of over ten megapixel cameras scheduled to launch this year." TV-IP572W features include: 1280 x 800 (WXGA) H.264 video at up to 30 frames per second (fps); a high speed wireless n connection; two-way audio; a free mobile app; free industry leading software to manage up to 32 cameras; and a wall / ceiling mounting kit. TV-IP572W Availability: Currently shipping to TRENDnet's online and retail partners. TV-IP572WI features include: night vision for distances of up to 7.5 meters (25 feet); 1280 x 800 (WXGA) H.264 video at up to 30 frames per second (fps); a high speed wireless n connection; two-way audio; a free mobile app; free industry leading software to manage up to 32 cameras; and a wall / ceiling mounting kit. TV-IP572WI Availability: Currently shipping to TRENDnet's online and retail partners. TV-IP572P features include: 1280 x 800 (WXGA) H.264 video at up to 30 frames per second (fps); Power over Ethernet (PoE) network connectivity; two-way audio; a free mobile app; free industry leading software to manage up to 32 cameras; and a wall / ceiling mounting kit. TV-IP572P Availability: Will be available from online and retail partners in early June. TV-IP572PI features include: night vision for distances of up to 7.5 meters (25 feet); 1280 x 800 (WXGA) H.264 video at up to 30 frames per second (fps); Power over Ethernet (PoE) network connectivity; two-way audio; a free mobile app; free industry leading software to manage up to 32 cameras; and a wall / ceiling mounting kit. TV-IP572PI Availability: Currently shipping to TRENDnet's online and retail partners.